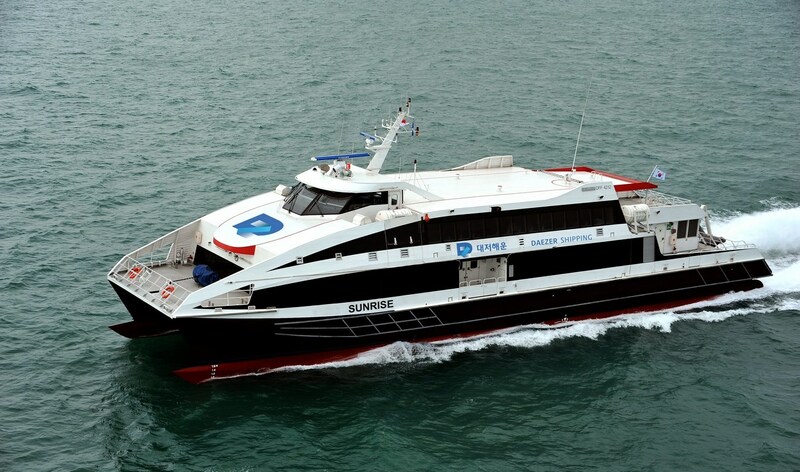 Home › Passenger Ferries › Fast Ferry › Damen Fast Ferry 4212 › Damen Fast Ferry 4212 "Sunrise"
In May 2015, operator Daezer Shipping took delivery of a DFFe 4212 named Sunrise from Damen Shipyards Singapore (DSSi). Delivered within three months of ordering, the vessel is powered by four MTU main engines (16V2000 M72) reaching a speed of over 40 knots. The Sunrise is currently operating a route of very popular tourist destinations on Koreas East-coast from the island of Ulleung to Dokdo. As a relatively new ferry operator and new customer to Damen, this recent acquisition has seen Daezer increase their service offering in the region.